Being Frugal and Making It Work: Make Brushing Fun: Oraline Children's Oral Health Products! 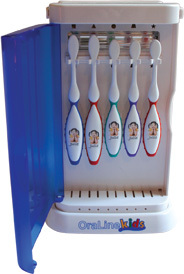 Make Brushing Fun: Oraline Children's Oral Health Products! Oraline makes a line of children's oral health products that make brushing fun, including toothbrushes that have cute pictures on them. In fact, you can customize their toothbrushes with your child's name and photo or by adding their favorite animal. Let's face it, the bathroom is filled with germs, so it's important to teach our children the importance of proper sanitizing and personal care. I know it's gross, but just think of what your children touch after using the restroom, and what they do next. We keep our toothbrushes in the bathroom, so making sure that we teach our children the proper way to wash is crucial! One way to help minimize cross contamination is to use a toothbrush sanitizer! Have you heard of Oraline products? It's a wonderful company that allows you to personalize your child's toothbrushes with their names and a photo of themselves! Or you can choose to add a personal message or even a photo of their favorite animal. Each sanitizer bundle includes a toothbrush sanitizer, 6 toothbrushes, and 12 tubes of bubblegum toothpaste! All for the low special introductory price of just $59.95! The toothbrush sanitizer holds up to 5 toothbrushes at one time and kills 99% of the germs in just 10 minutes! It also doubles as the perfect place to store your toothbrushes when they aren't being used. Again, helping keep them cleaner. Did you know that dentists recommend kids brush their teeth for at least two minutes every time they brush? We started at a very early age, just by letting our little ones chew on toothbrushes and visit the dentist as young as 6 months of age - just to get them comfortable with the whole process. Make it a friendly competition by brushing at the same time and see you can brush the longest! For a limited time, you can take advantage of the Gifts with Purchase Program! The first 100 people who order the Oraline kit will receive a fantastic gift bags!!! Just for ordering – No additional charge – Absolutely FREE! These Maggies Clubs Gift Bags contain sample products from a variety of top brands that moms use everyday! Disclaimer: I received complimentary Oraline toothbrush sanitizer kit as a member of Maggie's Clubs for the purpose of writing a review. Regardless, I only recommend products or services I use personally and/or believe will be a good fit for my readers. The views and opinions expressed on this blog are purely my own. Results may vary. What is your child's favorite toothpaste flavor? My boys' favorite is mint, but not "spicy" mint! So cool! Never seen anything like that before. Oh wow, that is so neat!!! That is so cool!! I love that you're able to keep the toothbrushes so clean! What a great way to keep brushes clean and keep kids active in oral care! Those are cute! love the case! Oh I want this! My kids are always knocking their toothbrushes on the floor (yuck! ).